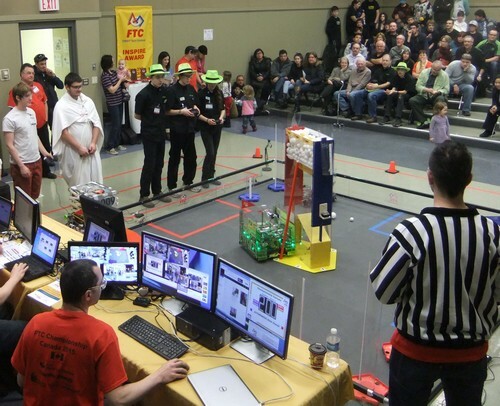 We had a chance to get to know the teams and their robots during a full day of practice on Feb. 7. It was a great chance for us to fine tune our autonomous programs and make some new friends. Our first couple of matches went well, but our autonomous program was blocked. Then came the perfect match. We scored both balls in the centre goal in autonomous and then knocked out the kickstand. It was great to see that all the testing on Saturday paid off. 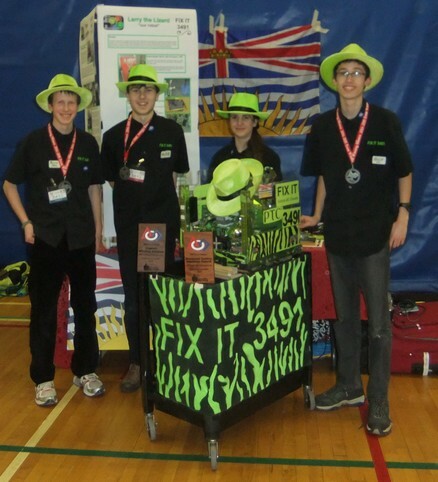 Unfortunately, they had mechanical issues and sat out for most of the semi-final matches. It took three matches, but we won and went on to the finals. Fortunately, Helios had fixed their problems, went through re-inspection and were ready to play! The first match of the finals was our high score for the day, 493 points. After winning the second match of the finals, we were Captian of the Winning Alliance, received the Rockwell Collins Innovate Award and had qualified for St. Louis! Thanks to Phillip and his volunteers for a great event! This page contains a single entry by Christine published on February 16, 2015 8:07 AM. State 2015 was the previous entry in this blog.